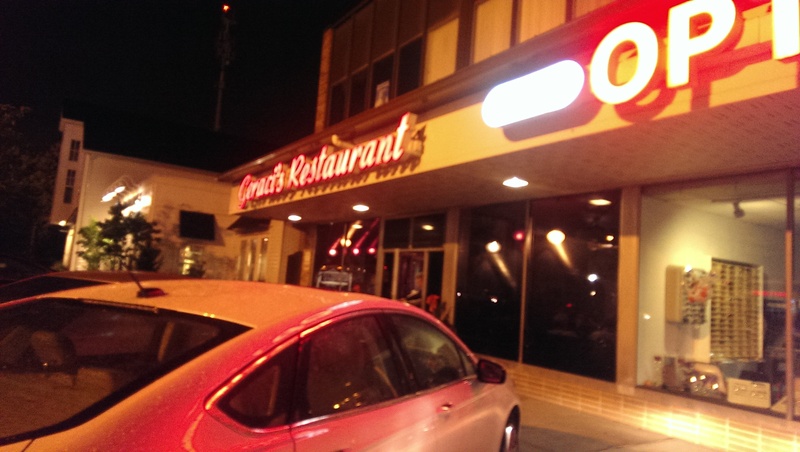 Geraci’s is family-run restaurant with fresh Italian cooking from scratch. They have been in business since 1956, so they must be doing something right. It is also popular with John Carroll students, and they have a special section on the menu for them (billed as “late night dining” – although they are only open until 9 PM and 10 PM on Fridays and Saturdays). 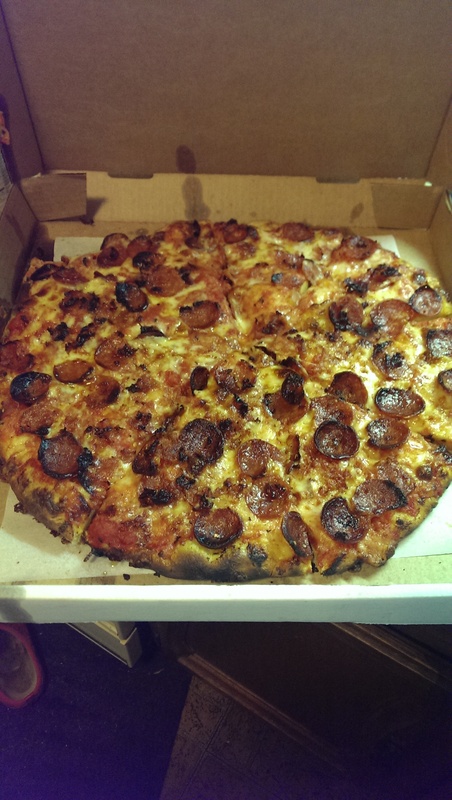 Geraci’s is known for its pizza, so much so that it was featured on Diners, Drive-ins and Dives. The bread service features crusty and soft Italian bread with a dusting of sesame seeds on the crust and packets of soft butter. 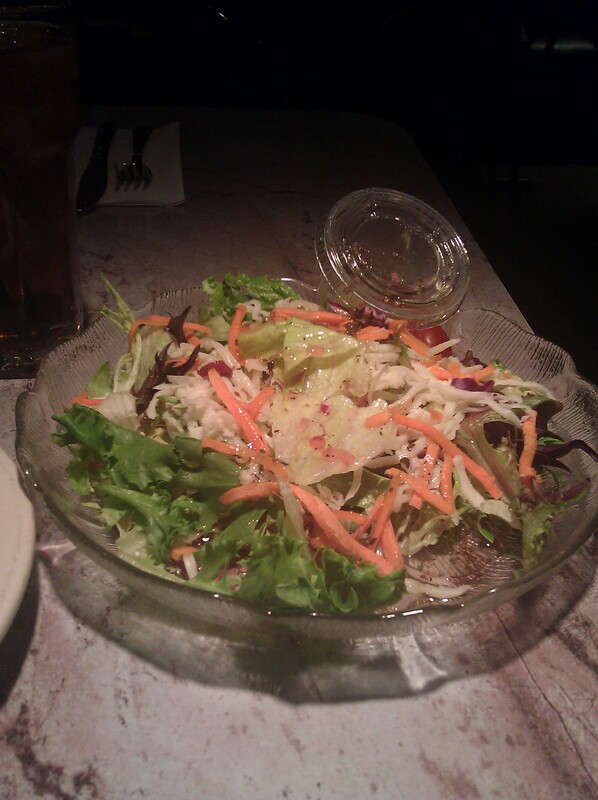 The House salad dressing is a good choice if you like red wine vinegar. It’s pretty overwhelming. You can order it with and without grated mozzarella on it. The only thing I have ordered here that disappointed me was the spaghetti and meatballs. I thought the meatballs and sauce were pretty bland. I’ve learned not to order spaghetti and meatballs in Italian restaurants around here. However, they offer a lot more than spaghetti and meatballs. They are known for their Geraci’s sauce, which is a red sauce. You can also order spaghetti with fresh mushrooms, meat sauce or marinara and upgrade with a meatball or Italian sausage. They also offer gluten-free pasta and whole wheat pasta for an upcharge. 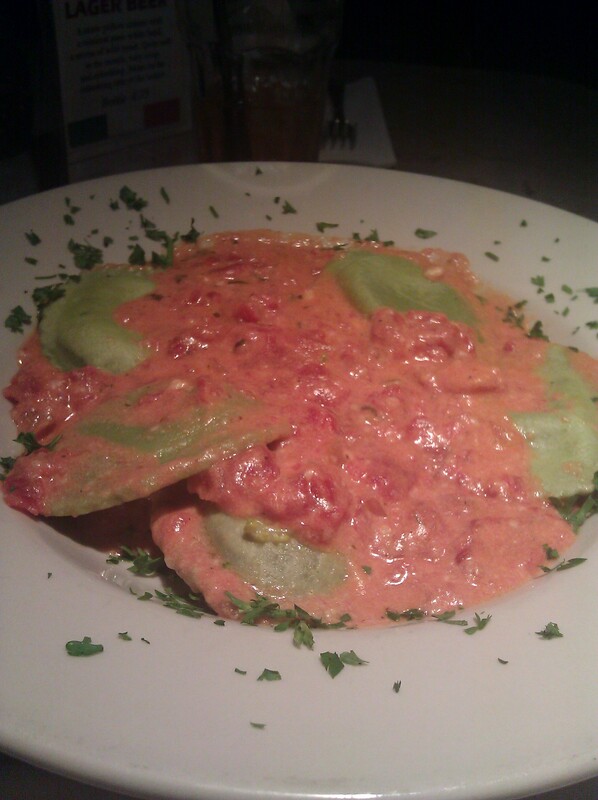 The spinach ravioli are absolutely fantastic. The ravioli are large and the sauce is a tomato cream sauce that really complements the cheese ravioli. It is a creamy delight. I didn’t even miss the meat. Geraci’s also offer veal and chicken entrees. The Chicken a la Tosca was out of this world. I wasn’t expecting such a large portion. 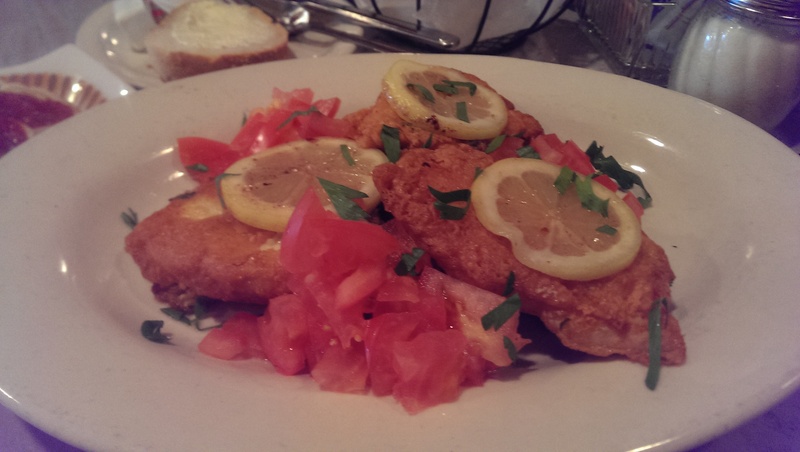 It came with three chicken cutlets dipped in egg batter and lightly fried and served over a bed of garlic spinach and diced tomatoes. The chicken was really moist and tender. The heavenly smell as they were frying it permeated the restaurant (I was the only table left after their lunch rush), which made me really anticipate the meal. It was served with a side of spaghetti. I was able to upgrade it to the meat sauce for an extra dollar. I had been wanting spaghetti that day, but didn’t want a huge plate of it. This was perfect – and I was able to bring two of the three cutlets home for later. Everyone raves about the pizza, however. I have friends who travel all the way from the far west side for a Geraci’s fix. Reading all the suggestions for the pepperoni pizza on Yelp I felt the need to order one even though I am not a huge pepperoni pizza fan. My friend who loves it suggested I get the large with extra pepperoni, because she feels it is their best one. It was okay, but it didn’t thrill me. The sauce is a little sweeter than most, and the crust is a little stiff (I prefer a little doughier, chewier crust). And it was more burned than I like. I’ll stick with the chicken and pasta here in the future. Make sure you come with cash though. 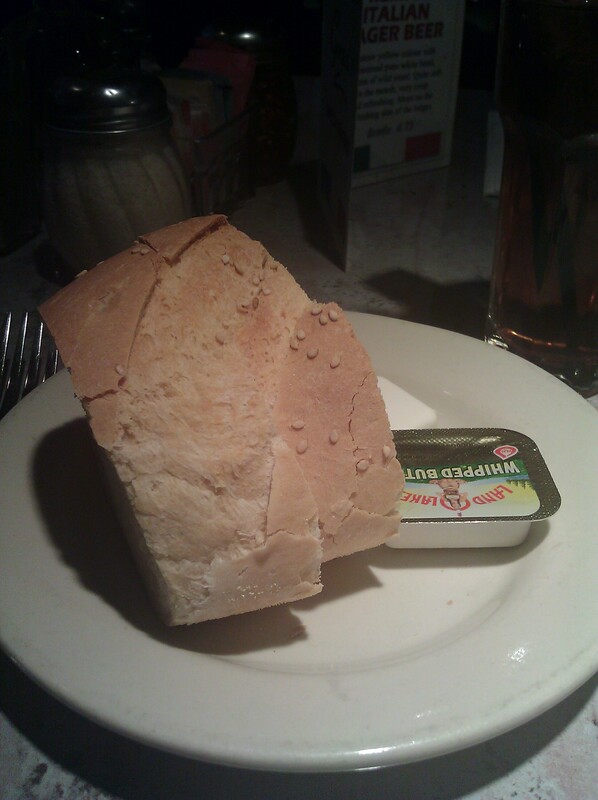 This is a true Italian restaurant. Cash or check only.